Gold is a rare metal with a beautiful luster. It is alloyed with other metals to increase it toughness and durability so it can be used for jewelry. Different alloys create different colors of gold jewelry. Copper for rose gold. Nickel, zinc and palladium for white gold. Silver for green gold. Percentages of gold are expressed in karats. The karat indicates the amount of gold as a percentage of the total weight. 24 karats is 100 percent gold. 14 karat gold is 14/24 gold or 58.33 percent gold. Gold over silver is a special laminate process first fabricated by Ed Levin in the 1980's. A 14kt gold sheet is bonded to a sterling silver sheet. Ed Levin's gold over silver earrings are more than 25% 14kt gold by weight. Gold over silver is more valuable than gold filled or plated jewelry. Gold filled is a process by which a layer of at least 10kt gold has been mechanically or pressure bonded to a base metal. 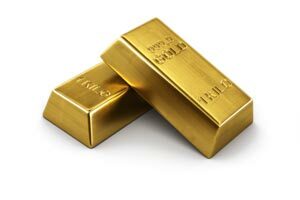 The percentage of gold in gold filled jewelry must be 1/20th by weight of the total product. Like Gold Over Silver jewelry, gold filled jewelry will wear the same as karat gold jewelry. Gold plated jewelry has been "flashed" with a very thin layer of gold over another metal. This layer is only microns thick and will wear off over time. Vermeil jewelry is gold plated sterling silver. This is often considered a very affordable alternative to higher priced golds. Although not as enduring as other golds, it is a fashion alternative at a very attractive price. Phillip Gavriel vermeil earrings are a great example.